Eighteen minutes after Ferrari revealed that Kimi Raikkonen is to leave Maranello at season end, Sauber confirmed The Iceman for 2019 and 2020. "The Alfa Romeo Sauber F1 Team is delighted to announce that Kimi Raikkonen will join the team from 2019," said the Swiss outfit in a brief statement. Confirming that Raikkonen has signed for the next two seasons, Sauber added that in his career, Raikkonen has secured 20 Grands Prix wins and 100 podiums, making him one of the most highly regarded drivers in the history of the sport. "The Alfa Romeo Sauber F1 Team looks forward to the arrival of the Finnish driver, with whom the team shares the common goal of achieving ambitious results," it added. "Signing Kimi Raikkonen as our driver represents an important pillar of our project," said Frederic Vasseur, CEO of Sauber Motorsport and Team Principal of the Alfa Romeo Sauber F1 Team, "and brings us closer to our target of making significant progress as a team in the near future. "Kimi's undoubted talent and immense experience in Formula One will not only contribute to the development of our car, but will also accelerate the growth and development of our team as a whole. Together, we will start the 2019 season with a strong foundation, driven by the determination to fight for results that count." The move sees Raikkonen go full circle, for it was at Sauber he made his controversial debut in 2001. With just 23 (car) races under his belt, there was widespread concern at giving a superlicence to such a relatively inexperienced driver, FIA president Max Mosley among those unsure of the move. The Finn went on to score a point on his F1 debut, finishing sixth in Australia. "This move gives Ferrari a backup plan if Leclerc isn't the hotshot he actually is and Vettel walks all over him. They can switch drivers mid season without any arguments. 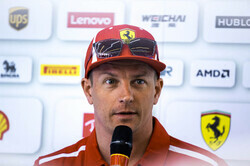 It allows Ferrari to try out a driver and also keep Kimi, who is a known fast quantity, on the books should the manure hit the fan. Also allows Sauber to test young drivers against Kimi without disrupting the main Ferrari team. Genuis move as far as I'm concerned." "I fully appreciate that Kimi is not known for demanding or looking for "number 1" status within a team but I think that these two years as Sauber's "lead driver" could be just what he needs to round out his career too. Heck if Sauber can build even a half way decent chassis around that Ferrari engine he could well end up being "the best of the rest" all by himself! Also gives the likes of Bottas Leclerc some extra motivation. The last thing they want is Kimi, in a Sauber, getting the better of them, even once or twice. Also I bet Max and Red Bull are now even more concerned about that Honda engine. Imagine if, after six races Kimi is ahead of Max in the championship! Wow! " "@Chris Balfe, I sadly think Sebs days are numbered. He makes too many mistakes! Its a good move for Kimi cos I just know he is a racer, great to watch!" "A good move for all..."
Though possibly not Seb, for we know how it went when he was joined by a certain young Australian rookie in 2013. Hopefully it will give Seb the kick up the backside he needs. "I think its a good move for all. Leclerc is definitely a star of the future and it will be good to see how he compares with Vettel. On the other side, Raikkonen rarely makes mistakes, doesnt wreck the car and I cant remember when he last caused an incident where he was totally to blame. A good driver, knows F1 backwards. As I said, good move for all"
"And if Ferrar fall out of love with Vettel, Kimi isn’t that far away..."
"Peter Rickitt: I get your point but they are not set up to be a "team in their own right", theyd need to get some sponsors to pay the bills for a start. I (and its an opinion only) want to see young guys given a chance even if their daddy cant afford to buy a team." "This is cool to see. It reminds me a little of when Jacques Villeneuve was bouncing between teams later in his career. He didn't mind they were a bit off the pace, he just wanted to race. Fellipe Massa did a similar thing. Something I like about Indycar, is that the drivers often stick around a lot longer. It adds a lot of continuity to the championship over time." "Still a Ferrari engine, and will help them develop even further up the ladder. " "Didn't see that one coming and I'm pleasently suprised. You have to hand it to his management team, I presume it is a well paid gig and it's highly likely to be subsidised by Ferrari. It also wouldn't suprise me if Steve Robertson went knocing on liberty's door to cough up a few quid, not wishing to see another big star walking away from the sport. "McMacca - what rubbish: why should any team be a 'proving ground' ? They have every right to be a team in their own right - I wish Kimi and Sauber well - go and stuff it to Vettel !" "What a waste of a seat, nothing against Kimi, but Sauber and others should be a proving ground for the next Leclerc not a retirement home. "